When it comes to season-long fantasy football, you play your studs unless there is an injury, or you are loaded at a position and have other studs on your bench, or it’s a bye week. Try not to overthink it. You are playing head-to-head against one opponent each week. You just have to beat that opponent (who also probably has weaknesses in their lineup). Unless you are a huge underdog that week, don’t get cute. This article is to provide some additional information as you set your lineups this week. If you have a player that we list in the “sit” category, you shouldn’t automatically sit him because you might be replacing him with a much worse player. Think of Start/Sit rather in terms of “Confident/Cautious.” These are players that we seem to be getting a lot of questions about. We offer our take on whether you should take a confident or cautious approach to playing them this week. In most cases, we don’t touch upon the obvious plays. There are other Start/Sit articles (I won’t name names) that will tell you to start Christian McCaffrey this week because no team has given up more touchdowns (17) than the Bucs have given up to opposing Running Backs this season. No, you start him because he went for 40+ fantasy points last week and overall has seven games of 20+ fantasy points. This dual-threat Running Back is a stud and that is why you play him. We don’t list obvious plays so we can look like we are smart when the obvious plays do what obvious plays do. That doesn’t help you. We try to look at some of the plays that are questionable and give you insights on those. Remember to check the news and injury reports, leading up to roster lock for the various game times. Nobody knows exactly what will happen from week to week in the NFL but use all the information and resources available to you to make the best decisions possible for your lineup. We believe in having a good process and good rationale. Good luck and have fun! Also, feel free to hit us up on twitter @Couch_Potato_GM or @WinningDFS101 and we’ll do our best to answer your specific start/sit questions. This is not a guaranteed Top-12 QB pick. But this is exactly the kind of streamer start you might want to consider if you are lukewarm about your Quarterback position this week. There is a lot of excitement and buzz around Jackson. The matchup is juicy this week and his floor is fairly secure. The Falcons have allowed the second-most points to the Quarterback position this year. He was QB13 in his first start against the Bengals and then QB15 in his second start against Oakland. He has a rushing touchdown in each of those games. Both the Ravens and Falcons play at a fairly fast pace and this game carries a 49-point projected total. In the 6 games played in Atlanta this year, the average total has approached 60 points. This could be a shootout and if that is the case, I like the upside of Jackson. This play is not for the faint of heart or risk-averse fantasy GM. If Joe Flacco plays or there are indications that he is likely to see snaps, then you’ll probably want to look elsewhere. But Jackson carries a nice floor and if he could actually connect on some passes (which he should be able to do against the Falcons) then we could see his ceiling. A good friend of mine texted me this week asking which Quarterbacks I liked. I gave him a couple of suggestions and he then responded back with the same sentiment that I have had far too often in the past, “I kind of like Stafford. They should be down and he’ll be throwing to catch up.” The Lions are 4-7. They have been down a lot this year. Stafford has had only two games all year with 20+ fantasy points and none since Week 4. In fact, he has had two single-digit fantasy performances in his last four weeks. You know how special team units have code words that mean to get away from the ball and get away quickly? Find your code word for Matthew Stafford. I don’t care what it is but stay away. Stranger Danger! This is not the Matthew Stafford fantasy Quarterback we’ve seen in past years. Stranger Danger! Get away. I could speak at length why his performances are down this year but that doesn’t matter. He’s ranked behind the now benched Blake Bortles in fantasy points for the season. You can judge a tree by its fruit. Well, it is no different with a fantasy Quarterback when it comes to Week 13. He is what his stats say he is. This scares me to write this because I don’t trust Mike McCarthy and his ability right now to get the most out of this Packers’ offense. However, I can’t argue against the recent results and trends just because I have some deep-seeded trust issues. Jones has averaged 26 fantasy points in the last three weeks. He has scored five times during that stretch. This is a great matchup on paper because the Cardinals have not been able to stop the run all year. They have given up 16 rushing touchdowns and are ranked next-to-last in fantasy points allowed to Running Backs. He now appears to be the bell-cow despite McCarthy not wanting this to happen. 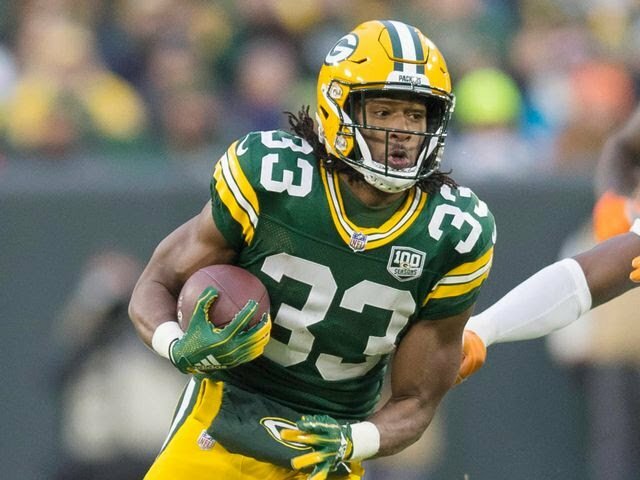 In the last three weeks, he has played 79% of Green Bay’s snaps and earned 90% of the team’s carries. He has also seen all 11 Running Back targets for the Packers in the past two games. Oh yeah, it’s also his birthday on Sunday if that counts for anything. This game has the lowest projected total of the weekend (40.5) and Crowell might be the worst starting Running Back in the league. The Titans are ranked 6th in fantasy points allowed to Running Backs. Crowell might be starting but doesn’t have a hold on the position as Elijah McGuire and Trenton Cannon are joining him in a three-man committee. Crowell hasn’t topped 50 rushing yards in any of his last 6 games. Do not hold your breath that he’ll have a 2 touchdown performance like he did in Week 1 or Week3, or that he’ll go for 219 yards like he did in Week 5. There are a lot of people that win some money every now and then at a casino slot machine but casinos aren’t built on winners. They are built because people only remember the times that they win. Crowell is a bad Running Back for a bad team. Do not get suckered into helping build another casino. Nine total games of less than 50 yards rushing is not the type of player that gets you into the fantasy playoffs. I picked up Reynolds off waivers this week and have him inserted into my starting lineup already. This is a bit of a speculative play, especially since I am planning on starting him over Calvin Ridley (I also have Julio Jones so it’s not as big of a deal to play Ridley). The Rams love this guy. 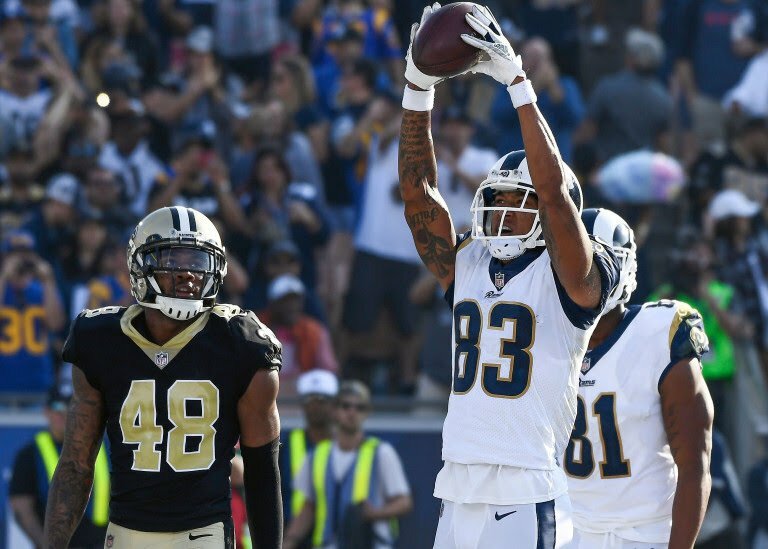 If it wasn’t for the all-world trio of Cooper Kupp, Brandin Cooks, and Robert Woods, Josh Reynolds might be a fantasy darling. Now with Kupp out, Reynolds has gotten a chance to play. In the three games Kupp has been out, Reynolds’ snap percentage and target count has increased from 83.6% (1) to 88.5% (5) to 97.5% (8). He has scored three touchdowns in that stretch. Last week he put up a 6-80-1 stat line. The Lions are next to last in the NFL in pass defense DVOA. It is always a good idea to get a piece of the Rams offense and Reynolds might be available in your league. There is no question that you should pick him up. The only question is whether you start him this week. I anticipate the Rams scoring at will and Reynolds seeing a lot of opportunity in the red zone (just like Cooper Kupp used to). In the last two games, Reynolds has seen 5 red zone targets. I am hoping to reverse-jinks Gabriel because I really like him and want to see him explode this week. I just don’t think it is the likeliest scenario. Even though he leads the team in targets, catches and yards, he just isn’t doing enough to warrant a start in my lineups. If Trubisky was healthy, I might change my tune but I don’t know what to expect from Chase Daniel. Gabriel had really nice back-to-back games in Week 4 and Week 5 but since then has been a non-factor in terms of fantasy production. He always carries the big-play potential and Matt Nagy could game-plan him for a big-game like he did in Week 4 but I am not going to count on it. I’ll root for it but not rely on it. If you take away his two 100-yard games this season, he is only averaging 34 yards per game receiving. I am not real big on touchdown dependent plays but I like Brate. This game has a 55.5 projected total, which is the second-highest on the weekend (though I would expect the Chiefs-Raiders 56.5 to come down a little bit with the late news of Kareem Hunt being cut). 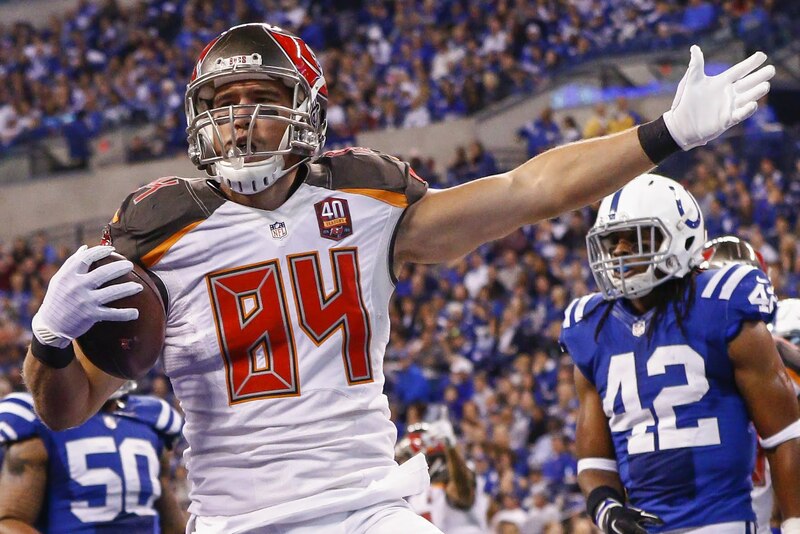 Brate is the only option at Tight End with O.J. Howard out for the season. DeSean Jackson is also out for this game. Obviously, Brate and DJax have entirely different games, but it means that there is one less mouth to feed. His stat line (3-26-1) wasn’t great last week but he was targeted an additional time in the end zone. The Panthers have been the worst all year against the Tight End position giving up 9 touchdowns to the position (most in the league). Because they give up the most, that is one of the reasons I don’t mind a slightly more touchdown dependent Brate this week. It’s hard to say that anyone in this Rams offense is a bad play but this is more of a cautionary pick. Yes, Everett scored two touchdowns but he did it on only 4 targets. This was in a game that Jared Goff had 49 pass attempts. You can chase touchdowns again with Everett but 4 targets on 49 total passes tells me that he is a mere after-thought in this offense. Scoring twice on those 4 targets is unsustainable. This was the only game all year that he has had double-figure fantasy points. Unless you have one of the top defenses that are probably an automatic start each week, then you might want to consider streaming your defense each week with a team that has the best matchup. Remember, low scoring games is not the only factor for a good defense. You can’t predict fantasy defensive scoring, but you can predict opportunity. You typically want defenses that are aggressive and get pressure on the quarterback. This pressure can lead to turnovers. It is also a decent gamble to target defenses going against rookie or inexperienced quarterbacks. Playing at home is a plus. Finally, game flow matters. A game that will be slow with a lot of rushing attempts is not good for fantasy scoring. Also, it is possible for a defense and an opposing Quarterback to both put up good fantasy numbers in the same game. 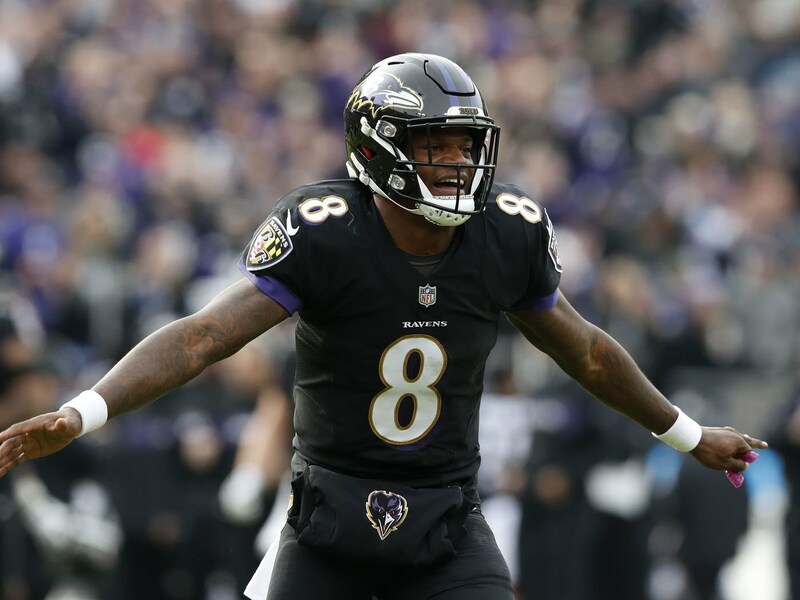 Here are three teams that you might want to consider streaming for this week, along with three teams you’ll want to be a little cautious with. Want more CPGM content? Sign-up for our FREE Newsletter. Jamy Bechler is a fantasy contributor for CouchPotatoGM and FantasyPros. His DFS twitter is @WinningDFS101 and his website is FantasyFocusFootball.com. He has won a fantasy league drafting last, trading away Ezekiel Elliott and having Tyrod Taylor as his starting Quarterback. When he is not playing fantasy sports, Jamy is an author, host of the “Success is a Choice” podcast, and is a leadership trainer, working with businesses and teams across the country (including the NBA). You can also follow his personal twitter account @CoachBechler. Even though he offers his advice on players and contests, after additional information and consideration, he may end up using different players and strategies than what he recommends. Related Items#CPGMFantasyFootball2018 Fantasy Footbal LIneup2018 Fantasy Football2018 Fantasy Football Start/SitAaron JonesCameron BrateFantasy Football Week 13FeaturedJosh ReynoldsLamar JacksonSitStartStart and SitStart Em Sit EmStart Sit DecisionsStart/SitStart/Sit Week 13Week 13 Fantasy Football LIneup DecisionsWeek 13 Start/SitWeek 13 Start/Sit 2018Who should I start fantasy football week 13?Who should I start in Fantasy Football?